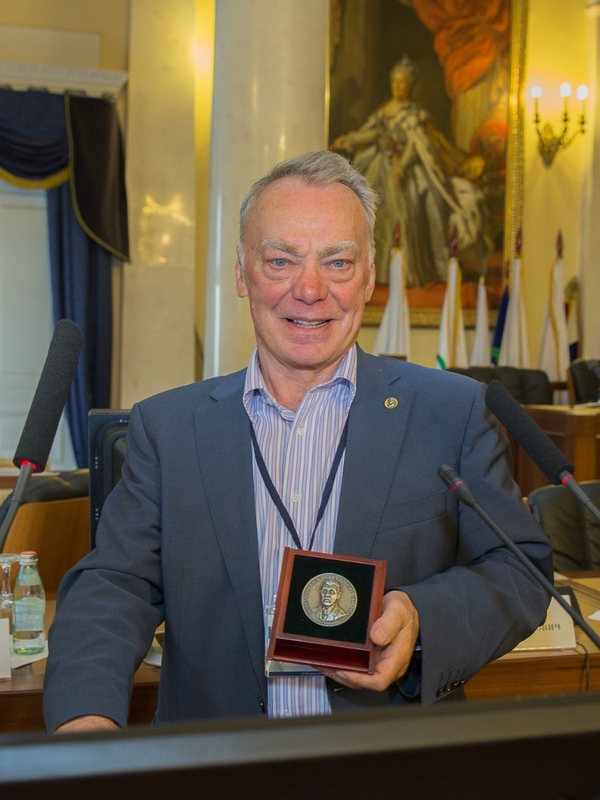 Victor I. Osipov was awarded with the medal "For outstanding contribution to soil and rock engineering"
Director IEG RAS academician Victor I. Osipov was awarded with the highest prize of the Okhotin society of soil scientists - the silver medal "For outstanding contribution to soil and rock engineering". Lyceum of permafrost young researchers network in Russia (PYRN) is going to be international! The unique meeting with famous permafrost researcher, who broke the Arctic thousands of miles, was held at the Sergeev Institute of Environmental Geoscience,RussianAcademyof Sciences (IEG RAS) on 30 May, 2013. The EGU General Assembly 2013 (http://www.egu2013.eu/) which took place at Viena, Austria on 07–12 April was a great success with 4,684 oral, 8,207 poster, and, for the very first time, 452 PICO presentations. At the conference 11,167 scientists from 95 countries participated, of which 28% were students. Еhe EGU General Assembly 2014, 27 April – 02 May 2014, will be held in Vienna, Austria. Workshop "Environmental security of the European cross-border energy supply infrastructure"
On 30-31 October 2012 the Workshop "Environmental security of the European cross-border energy supply infrastructure" in frame of NATO SCIENCE FOR PEACE AND SECURITY PROGRAMME was held in Moscow. under the unknown circumstances of our colleague and friend, director of Institute of Hydrogeology and Engineering Geology, Georgian Academy of Sciences. Prof. Guram I. Buachidze, in August 2008.
for participation in Taiwan-Russian Joint Symposium on Natural Hazard Monitoring, Risk Management and Reduction was held. During 2004-2006 the deparment of measurement system of IEG RAS has developed the "Topside induced accelerations monitoring systems (TIAMS)"
for oil platforms in the project Sakhalin-2. The customer of contract is Sakhalin Energy. In July 2004 Dr. Svalova V.B. was elected to IGA BoD (International Geothermal Association Board of Directors) for 2004-2007 years. Granted collective decided to transfer the Premium to the Fund of help to children of Beslan.